Hand wash your dishes or wipe-off countertops in your bar or restaurant with this durable and dependable Choice 15" x 26" white 24 oz. herringbone dish towel. Made of 100% cotton and weighing 24 oz., this herringbone dish towel is extremely absorbent and is perfect for leaving your dinnerware or beverageware sparkling! Plus, this unique v-shaped weave pattern makes the towel strong and unlikely to stretch or tear. Your staff will love this dependable towel for repeatedly polishing dishes and silverware at your high volume venue. I'm sure these towels are great, but they are not at all like the color pictured. Be sure to read the policy statements about inherent dye lot variations, though the color I received was so blue as to be an entirely different product than shown. Disappointing. We appreciate your review, Emily! If you are having any issues with the product you have purchased, please contact our Customer Solutions team. These towels are the worst purchase I’ve ever made. After zero uses and one wash with mild detergent (I washed them separately from anything else), they unraveled at the seams and pilled beyond belief. I’ve found better quality towels at the other stores. This is not a saving money towel – it is a complete waste! We appreciate your review, Jennett! Our Customer Solutions team will be contacting you shortly. These towels come in handy in the kitchen, but they are not super absorbent. We have since ordered new ones so we hardly use these ones now. They are convenient to have around though! Our go to dish towel for our kitchen. We have stacks of these lining the counters as they are great for cleaning the workspace and your tools. Love these. They are very absorbent and lint free. We use this on our espresso bar and also to clean all surfaces in the shop. Will definitely continue to use these. These side towels are very versatile. We use them for all kinds of jobs in our kitchen, from oil spills to dish washing. They do hold stains though. I've been using these towels in my kitchen for quite some time, and although they are no longer white, I have not had one rip, unravel, shrink, etc. Great quality, great value, great product. I am purchasing more today. These dish towels are excellent. Long lasting, no fraying at ends. Very well made. Has held up for almost 2 years. I will definitely buy again. These lightweight towels are an excellent weight for many kitchen tasks, from cleanup to squeezing liquids out of fruits and vegetables. This size is great for use in sani buckets for any business trying to reduce its use of disposables. NIce towels, good looking, they get better with age. Keep them clean, wash with a little bleach, and they really hold up. We use them to wipe tables, dry dishes, etc. These, for the price, are ok. However, I find that other brands are thicker and less porous, if that makes sense. I still use them, but I like others better. Don’t quite like these towels. The color looks dirty soon as they touch water. Makes it look like I was cleaning with a soiled towel. Great product! At a great price. They are thin, but they hold up well in the washer. I use them for the kitchen. You get a 12 pk to last you for a few days. I received exactly what I saw. A good bargain for the price. It’s hard to get excited about bar rags, but this will get the job done. A good rag to have around the kitchen. great product. well made, they clean up really well, i have had them stained with tomato and strawberry and they come out white with no bleach. i would recommend them to anyone looking for good towels. Bought one dozen for use as hand towels in a home kitchen. Some of the corners ripped out in the first washing, due to poor stitching. Since mending, they have been fine. Easy to wash and fold. Took several washes before becoming absorbent, but now work very well. Seem to be holding up to heavy use. Would purchase again. Choice 15" x 26" Blue-Striped 24 oz. 100% Cotton Herringbone Dish Towel - 12/Pack - these dish towels are pretty thin. I would recommend getting a heavier oz, you can almost see through these. This 15" x 26" Cotton Herringbone Dish Towel does just what I want it to and the blue stripe makes it easier to separate towels to prevent possible cross contamination. Highly recommended! I bought these cotton dish towels for personal/home use, and I use them every day. They are a delight in every way! Good for: drying/wiping hands, soaking up spills, and picking up hot pans, among other uses. After the first wash cycle, the cotton weave becomes tighter and the fabric softens, making them even more pleasant to use. Unlike similar towels I've purchased from other stores in the past, these do not pill or leave lint behind. The teal herringbone detail is a nice aesthetic touch. Great value. Before I found these dish towels I was buying flour-sack towels at Target. These herringbone towels are cheaper per package, more durable, and you get more per package! They didn't seem very absorbent at first. However, after I put them through the wash a few times they began to wipe up better. They're a fantastic value for the money. I highly recommend! Great Buy. I often buy dish towels from other retailers but they are still rather costly. These are so inexpensive and work really well. Bonus is I don't feel guilty about tossing them after a few months because they were so inexpensive. Very useful towel, I use them all the time and wash they daily and they stand up to messes, daily laundering, and still look good. I really like these dish tools. They wash well and do the job of drying dishes and glasses. They are my go to town when drying glasses because they don't leave lint. They are small but they do a great job of absorbing water. The only complaint is that they wrinkle terribly so they have to be removed from the dryer when they are warm or touched up with an iron but they are 100% cotton so that is to be expected. Besides they won't win a beauty contest but they perform well. I bought these for the shop, but I liked them so well I ended up getting some for my personal kitchen. They are well made, absorbent dish towels. And the blue edge helps to differentiate them from other towels. Our preference is to use these towels for glass cleaning! They don't have little hairs and threads that get caught everywhere, which is helpful as all get out! Overall good quality. I've used them before and they hold up for moderate use. They do come in a different color than you order so be aware. We use these to wipe off hands while scooping ice cream. The have very little lint and are strong. Would recommend to anyone. Good product! Every restaurant needs this product. These are really affordable and lightweight, and they don't leave behind any fuzziness that a lot of the cotton rags often do. These are a lower grade dish towel. They don’t absorb much. I just use these for the soap and sanitizing buckets. I will be buying the 40 oz towels on my next order. I keep one of these choice dishtowels attached to one of the choice aprons I also own and it works perfectly whether I’m drying off a dish or my hands. This pack will definitely last me quite awhile. Super absorbent. I always keep one on a side pocket of my apron, plus, I keep one next to our sandwich station to quickly sope up any leaking fluids. Every once in a while, the edges will unravel but not often enough for me to buy another brand. These are a deeper blue than what it looks like in the picture. I was hoping for something more turquoise. But they still are good towels. Absorbent. Large enough in size. I love these towels, especially for the price. They absorb really well and they dont wash up bad either. Great buy. I have used mine several times and washed them several times so you wont hear any complaints here! Our staff love using the blue striped hand towels. We use them to clean many messes, such as tables, kegerators, as well as cleaning beer glasses. Durable when cleaning but definitely shrinks no matter what you set your wash temperature. We bring them to small private in home events as da they shrink we switch them as holders for the oyster shuckers to use when shucking. These are towels are great. It dries dishes very nicely and quickly. Great value for 100% cotton. I would highly recommend picking up extras so you have a clean towel every time as it is a great value. This dish towel is just great! Perfect quality and such an elegant blue stripe! Material feels right and it's really durable. I like a great price too! I bought these for cleaning up countertops at my home. They are very inexpensive and are better than using the disposable ones. A quick wash and they are ready to be used again. I decided to try these towels even though some reviews were bad. I'm glad I did. The color of the stripe on the towel is the same as the color on my monitor--a medium teal color and I like it. Also the weight of these towels is perfect for drying dishes and covering foods. Upon receipt I immediately put them in the washing machine. They come packaged with a large amount of sizing or starch and have a stiff, almost linen-like feel. They came out of the dryer in great condition, soft, didn't wrinkle very much and are very absorbent. I have already used several and am going to order more in other colors because, for the price, these are a steal! Really nice lint free glass polishing type herringbone towels, especially after they get washed a few times Half the price per dozen of a local distributor. Highly recommended. I purchased these to use as a napkin for a rustic wedding to class up my disposable place setting. I'm very pleased with the quality! I have been using these for the last three months. They are washed daily and so far they are holding up great. As others have noted the blue strip is not a dark as shown in the picture. I don't care but I know that some might care about the color. They work great as dish or hand towels. We use these to wipe our portafilter. They work fine for what they are. They do eventually start ripping and cause the towel to thin out. We are pretty satisfied with these dish towels. They are a good size and very durable. They get a little discolored after washing, but they do their job well. I would purchase again. These towels are great for everything. I use these for covering my baked goods while proofing, use them on my cake rolls when rolling up to cool and I also use them for cleaning up. Smooth fabric with no lint. The absorbency of these towels is just alright. They are strong and come out of the wash good but I feel I constantly need to grab a fresh one. They are ok for the price. This is a great product. It has lasted over a year with heavy use and still going strong and durable. Excellent price also. Will be buying more soon. Good towels. Great for cleaning up a mess. Easy to clean and store. Unfortunately, theyre not as absorbant as id like. Not a bad product, but not great either. This is a great towel for the price. Great for shining and polishing plates and silverware. I would not use it for daily cleaning so keep them in the dish room. Choice 15" x 26" Blue-Striped 24 oz. 100% Cotton Herringbone Dish Towel - 12/Pack very nice dish towels especially once they are washed according to the directions provided. Received towels in a timely manner and nicely packaged. The choice 15 inch by 26 inch blue stripped dish towels are exactly as described and a quality made product that I would recommend to anyone who is looking for a good dish towel. These towels are the BEST!!! Compared to the bar towels, these ones are much more nicer. I love that it's so smooth that it is easy to clean and wash. Also, it doesn't smell as much as the bar towels. I bought this for my upcoming BBQ wedding to use as napkins. They are perfect! They aren't too big (like a large napkin at a restaurant), have a herringbone stitching to the material, and the edges are clean. It also has a nice feel. The color is more of a teal. I am very pleased with these dish towels. They do not shrink when washed, are very absorbent when cleaning up spills, and do a good job of drying off dishes. I wouldn't recommend these for drying dishes, but they do the trick for the initial wipe and let the rest air dry. They don't absorb moisture very well unfortunately, but they are great value and easy to clean. I bought these because they were recommended over the Chef Revival towels I was also buying. At half the price of the others, I fully expected to like them half as much. But I am pleased to say that I actually like them more! While they are certainly economical, I felt the quality was appropriate considering the price. My sisters bridal shower is coming up and I plan on tying these and a wooden spoon with a nice ribbon for the favors. These towels were perfect for our bartenders to wipe up small spills. The towels washed will and did not leave any lint. Looking forward to using them again. These Choice dish towels are affordable and high quality. They are not the most absorbent towels compared to other styles but they are durable and clean up nicely after going through the wash. These are not as water absorbent as I'd imagine, but they make a decorative and strong cover for produce at our store. There's no lint, so you can clean glass with this too! These are fantastic to have around. You can never have too many towels and these are cheap enough I don't mind using them on dirtier tasks since I can always get more. These are a great price, they wash very well. They were purchased for general use but I think they would look decent for service. Very happy! This is our go-to kitchen towel! It's a great size - easy to store and not too big or two small to get the cleaning job done! Plus, can you really beat the simple blue-stripe style? Very durable towel. I am pleased with the material of this towel. I feel it absorbs very well and does well when drying dishes or even cleaning counter tops! This bar towel is 24 oz. of 100 percent herringbone Cotten. This "Light Blue Stripped" bar towel is made by Choice. It comes in 12 pact at a great price! We love the fact that the towels come color coded which lets us distinguish application to different cleaning assignments. Sturdy and durable. 5 stars! Nice towels. They are a good size, and easy to work with. My biggest complaint is that there is no loop sewn in for hanging them. Also, they are clearly manufactured the cheapest way possible, but as long as you expect them to be elegant, that's fine. I would buy them again. Value towel for sure. They are a little stiff at first, so we recommend washing before first use. They are not the best as absorbing water, but good for a general purpose side towel that doubles as pot holders. We could not beat the quality of these towels for the price. 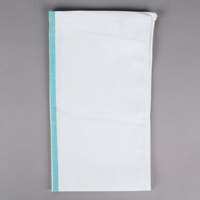 Although we were hoping for them to be a little thicker, for the price these are a great side and absorbency and the turquoise line makes it super easy to spot our towels amongst others. Very nice. We use as cloth napkins in our Cafe and these are perfect. If promptly removed from dryer, require no ironing for very nice look. I have bought a few different brands of these towels and the Choice brand has really been a great value. The towels stay more true to there size and hold up better than other towels I have tried. I would consider the stripe on the towels as more a green/teal color than blue, but that doesn't affect the quality of the towel. I like the smooth nap of this towel. These towels have managed a busy tourist season with ease and are still holding up well. They shrunk a bit after first wash but I expected that. They are great for wiping the countertop and keeping the sink area clean. Would not use them to dry dishes as they don't absorb alot. Would purchase again as they are much less expensive than our local distributor. A really strong white dishcloth that is white so it's simple to bleach and keep clean and looking nice. Great deal for as many as you get per package. These towels are great for wiping down tables in a restaurant or cafe. We use them with a sanitizer spray to clean off our counters and tables. You can't beat it for the price. Do keep in mind that these towels will need to be replaced semi-regularly, but I still recommend them for an inexpensive option. Great light weight towel with minimal fibers left on dishes after cleaning. Not great for drying soaked dishes after hand-washing, but sufficient for finishing off dish-washed dishes or wiping small spills. Does stain, but this is to be expected of 100% cotton. These towels are great for the price. However, if you have high traffic business; they are too thin and would not absorb much . They look nice I have ordered 2 packs . I should have checked the reviews before I ordered. I guess the customer service and the fast shipping make up for the flaw of the towels. These Blue Striped 24oz Cotton Dish Towels are great. They are a great value for the money. They have held up very well through many washes. These towels are great for our cafe. They stand up to the everyday use and are the perfect size for an espresso bar. The only downside is that they don't wash out very well and even running them through one wash cycle in a machine has left them feeling significantly thinner. That being said - they are still very absorbent. These towels are great for what we need them for, as we go through them all day long. We like that they have the blue stripe to distinguish which towels belong in kitchen and which towels belong in the restaurant area. Not very absorbent. These are great for cleaning but not the best for drying dishes. I would reorder again, and they are a great price for the amount you get. Decent towels for the cost. Certainly cheaper than the local provider. These towels are not particularly absorbent out of the package. However, after they have been washed a dried a couple of times, they become significantly more absorbent. We use these in our bakery café. They work well and clean up pretty easily. We tend to dye them with lots of food coloring but they are holding up well with lots of use. Oh my gosh I love these towels! They are super absorbent and they don't leave residue. They make me drying dishes easy because of how fast it takes to dry the dishes! I highly recommend these towels for anyone. I love these towels because I can get so many for such a good price. I wish they came in more colors to choose from. Great towel. We use this for drying glasses and although they start out stiff, they soften up and are decently absorbent. They don't shed or leave fuss on glasses. These are just what I expected. They are absorbent and inexpensive enough, that I don't worry about having yo throw them away if need be. But they wash we'll also. Very happy with them. These towels are awesome quality, and even more awesome for the price. I have bought a dozen to use strictly for crafting and hobby work. They are dedicated to that purpose and because of the distinctive green stripe in the middle it will be easy to tell them apart from other hand towels. Wonderful set / pack of towels that leave no lent and fibers behind, soak up a lot of moisture and stand up to many washes in the machine. Weve ordered many towels and have been impressed with most, these being some of the better ones. For a 12 pack, its quality and price that is hard to beat. When they get worn out they are cost-effective enough to order more and its much better than going through rolls of paper towels. These towels are great for our baking business, and the 'no' lint is a must. These are better than the ones from the restaurant supply store in my area at half the price. I wasn't impressed with these towels at first but they do get better as you wash them. They are a little thinner than I was expecting and shrink when washed but they absorb pretty well. I was hoping these were thicker and or different material. I purchased a lot of these thinking they were cotton bar towels, which they are not. They are not very absorbent and are very thin. My mistake. Better dish cloth then the ones I was buying at big box store. About the same price but these hold up a lot better after many washes. These are very good quality kitchen towels. They are used in my restaurant.and it is ok,they are cheap they retains full size with repeated use and washing. Your basic kitchen towels. These are great towels as it leaves no lint. Dries quickly, absorbs quickly, Ive ordered twice already and am looking forward to ordering it again! I previously bought another brand of bar towels and they left little fuzzies on everything for weeks (through several washes). I washed these once and they work fantastic - no little fibers all over the place. I'm using these as sanitizer towels and they're great. Fine bar towels. I like to use them for a variety of things around the house, so far have worked well for patting potatoes dry before frying as well us general water cleanup. I've been working in restaurants and food service environments for over 12 years and these are the best towels for wiping up spills. They're inexpensive, therefore disposable after those "tuff" spills or can be bleached. These are my favorite kitchen towels. Not too thick, not too thin, just right. The absorbency is perfect. Perfect for drying vegetables or wiping down surfaces. These are very good quality kitchen towels. They are used in our commercial kitchen. We had an older lot of kitchen towels which shrunk to half their size, so we expected the same of these. But they actually retains full size with repeated use and washing. I am not sure if it will be durable yet because I started using them a few days ago. The reason for my rating is the color and appearance of the dish towels, it's not bright white like the picture so it doesn't look nice like the one pictured here. The Choice 15" x 26" Blue Striped Dish towel is awesome, when they first arrive they are all stiff and loosely woven, but once you wash them twice they get so soft and supple... I love these towels and was glad to find them on your site. These towels will Get the job done, great for wiping down tables, chairs, counters etc. they did shrink up a bit after washing and drying but did not effect the quality. Don't be deceived by the great price -- these dish towels are very durable and wash up very nicely. We ordered a few packs for use by the kitchen staff at our wedding reception & they held up very well. I bought these to have towels to make jelly rolls with. They are great, since they don't shed. I think they shrank in the wash, which is the reason I gave it one less star. Great towels. Perfect for front of house, back of house, and bar service. excess lint free and super absorbent. Well stitched to prevent tears and ratty ends. These work good. We use these in our concession trailer to pick up pots and pans. We also wipe down counter and walls and floors and equipment with these towels. I purchased these to cut down on the amount of paper towels we were using when we cook. And we COOK every day. These have held up well and are easily washed/bleached and dried. These have been super handy to have around in our kitchen. Very absorbent, doesn't leave behind fibers, and have held up under some extraordinary wear and tear. We definitely recommend these. With all the cleaning we do in our store, we always have more than one towel, with the color stripe down the cloth we can now asign the cloth to a certain cleaning duty so there are no mixing cleaning chemicals. These are wonderful dish towels. Lightweight, but sturdy. They are absorbent and have a nice weave. The size is perfect for cleaning up or picking up hot pots and pans.